Welcome to Wine Quiz number Eight. Please choose from the list of possible answers to each question. 1: Fermentation converts sugar into what? Fermentation is the process by which yeast consumes sugar, one of the by-products being alcohol. 2: Saumur is a wine from where? Saumur is an appellation of the central Loire Valley in France, perhaps best known for spakling Saumur. Though since departed, Rovani was second in charge for many years. 4: Which of these estates commissions original art for its label each year? There’s an excellent museum of the original artworks at Chateau Mouton-Rothschild in Bordeaux. 5: What types of wine is Vinho Verde? In fact Vinho Verde can be white or red, and indeed is also made in fully sparkling and sweet styles. 6: Morgon and St Amour are what? These are two of the ‘Crus’ of Beaujolais – there are 10 in all, entitled to use their name on the label. 7: Which is a classic aroma of Cabernet Sauvignon? Blackcurrant (or ‘cassis’) is perhaps the most classic description of the aroma of Cabernet Sauvignon. 8: The black cockerel represents which wine region? This is the symbol of Chianti Classico, found on the neck-band of the wine or the label. 9: Which country is known for sweet wines made from the Vidal grape? Canada makes a lot of icewine from the Vidal variety, usually a bit less expensive than those made from Riesling. 10: What do the wine regions Reuilly and Sancerre have in common? Both have vineyards at over 1500 metres altitude. Both are in the Loire Valley and make whites from Sauvignon Blanc, but make reds from Pinot Noir. 11: An Estufa is used in the production of which wine? The Estufa is a room where Madeira wine is heated, part of its unique winemaking process. 12: Which of these is a New Zealand winery? Mount Difficulty is a well-respected winery in the Central Otago region of New Zealand. 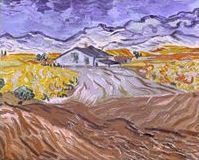 13: Van Goch painted this wine region in 1889. Where is it? This is the Provence region of France, not far from Saint-Rémy-de-Provence. 14: Which would normally be highest in alcohol? Dry Sherry is normally around 15% – 15.5% alcohol, whilst Vintage Port is rarely less than 20%. 15: Which country’s legislation covers Corsican wines? Corsica is a French island, so its wines are goverened by French legislation. 16: Which US state ranks 3rd in volume of wine produced? Washington is third, behind New York State with California way out in the lead. Oregon is fourth. 17: Tinta Negra Mole grapes make which wine? The vast bulk of Madeira is produced using this variety. 18: In which country has leaf-roll virus been a significant problem? This virus has plagued the South African industry for years, though there are now certified virus-free plant stocks. 19: This French wine comes from which Appellation Contolle (AC)? 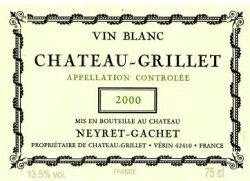 Unusually, Chateau Grillet is both the name of the producer and the name of this tiny appellation in the Rhone Valley. 20: Which Australian estate is owned by a famous Rhone producer? Michel Chapoutier makes very good wines at Mount Benson in Australia.